Christmas is round the corner and New Year is eagerly waiting to happily hop into our lives! The air is going to be filled with joy! Now how to make the most of this joy? Well, Swami says J in Joy stands for 'Jesus First', O is for 'Others Next' and in the last comes Y - “Yourself Last'. With this 'Joy Guideline' our celebration cannot be anything but glorious! Once God takes the best place in everything we plan, those plans can only turn out to be the best. When good things happen to us, to our plans, dreams and wishes for our own happiness, it is good. And when good things happen through us to fulfil the dreams and wishes of our near and dear ones, it is great. But when good things happen through us, and bring unexpected and hearty smiles on the faces of complete strangers, it is simply fantastic. That joy is truly incomparable. Those who have experienced it, know it and long for it. And those who haven't tasted it, should go for it at least once and feel something they have never felt before. And after this, tell us the story! Share that beautiful experience with all of us so that this joy only doubles, triples and multiplies endlessly. This is how we can create a 'joyful' world. On December 7, 2014 one of India's leading newspapers carried a story of two school kids (from Bhiwandi, 20 kms from Mumbai) belonging to underprivileged families recently turning in a bag containing Rs. 80,000 which they found on their way back from school. The parents of one child are daily wage-labourers while the father of the other works as a security guard and her mother is a domestic help. This is such a welcome news – news that gladdens our spirits and makes our soul smile, isn't it? But unfortunately this story was tucked away into a measly space in the deep maze of hundreds of other stories. The headlines on the other hand declared how someone was robbed in a ATM kiosk and another violently ill-treated by a cab driver – news that neither add to our joy nor inspire more 'joyful' occurrences. So this Christmas and New Year season let us bring to the surface and share more and more joyful stories. But this time with a difference. Now we want videos! Look around and spot the silent spectacle of goodness and godliness everywhere. In every city and every street, every neighbourhood and every park, there is someone or some group working to better the lives of their brethren, in Jesus-style. All you have to do is capture these scenes, package it well and send us the short videos. So become a Radio Sai Good News Journalist! Your videos can be in the form of a video documentary, or a news report (like Citizen Journalists do in commercial TV channels) or a beautiful collage of video clips and photos interspersed with interviews, or it could be real footage interlaced with beautiful animations.... no bar on your creativity! Any which way you can tell the story powerfully is perfect for us. 1. The video stories are not more than 10 mins. 2. Your videos are accompanied by your name, country and a short description of what you intend to share and how it happened. 3. Of course they have to be your own original videos which have not been used elsewhere thus far. 4. There should be no infringement of copyright in any form in making the video (you are welcome to use any audio from Radio Sai archives, for example an instrumental music piece or a song which you may wish to use as a background track). 5. If the file size is less enough for you to send it as an email attachment, then you have no problem. Else, you could send the video through websites that allow for transfer of bulky files (like wetransfer.com, transferbigfiles.com, etc.). The third option is to upload the video onto video sharing services (like youtube.com, vimeo.com, etc.). 6. 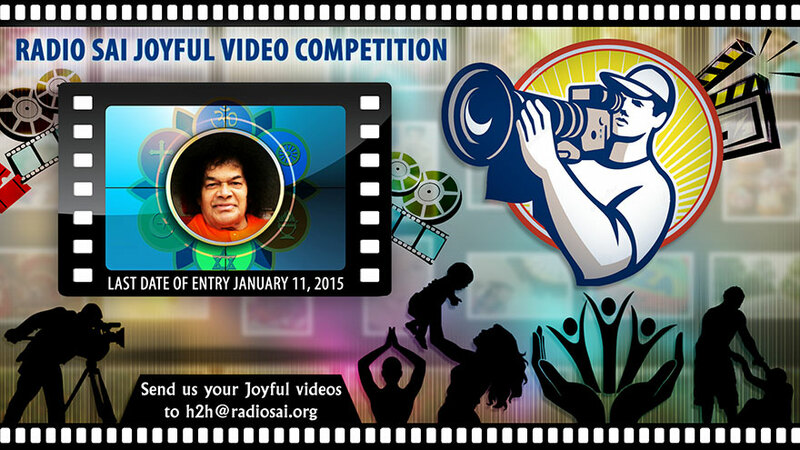 They should reach [email protected] latest by January 11, 2015, and carry the subject “Radio Sai Joyful Videos”. What We Intend to do with these? 1. First, we will collate every entry that reaches us into a DVD and offer it at Bhagawan's Sannidhi on Sankranthi Day, January 14, 2015. 2. We will have a panel of judges (who are professional documentary/film makers) evaluate your entries and then award the best submissions. 3. We will place all the commendable entries on our website and extend our hand to you in appreciation as well as in support. Yes, support because we need to work together to make this world a joyful place. Let us see, witness and capture these islands of joy all around us and then connect them! Connect them so that they become a sea of joy which can drown all our silly sorrows and make us smile all the while! What do you think about this Initiative? Please let us know by writing in to [email protected] or you may leave your thoughts in the comments section. Do not forget to mention your name and country.